Not knowing what the event is about, I had shrimp udon again. The "good luck shrimp tempura udon" was already over, so I had a regular shrimp udon. The shrimp was really small compared to the other one. Ha-ha! We won 4 pocket warmers and 1 yogurt drink at the drawing. Yep! They are useful! 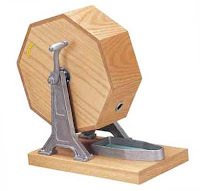 Now I just googled "Garapon" and knew it is a name of the drawing machine! I didn't even think it has such a funny name! It is actually a common drawing machine in Japan. You turn it around one time and a colored ball comes out from the hole. You get a prize depending on what the color of the ball is. Is this common in your country as well?! Okay, I think I gotta go now.